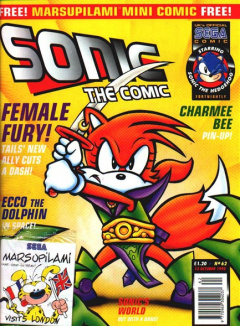 Sonic the Comic #62 is the sixty-second issue of the Sonic the Comic series by Fleetway Editions Ltd.
1.1 Sonic the Hedgehog — "The Brotherhood of Metallix, Part 4"
1.2 Ecco the Dolphin — "Return of Ecco the Dolphin, Part 3"
1.3 Knuckles and Tails — "The Revenge of Trogg, Part 4"
1.4 Sonic's World — "The Seven Badniks, Part 4"
Sonic the Hedgehog — "The Brotherhood of Metallix, Part 4"
Ecco the Dolphin — "Return of Ecco the Dolphin, Part 3"
Knuckles and Tails — "The Revenge of Trogg, Part 4"
Sonic's World — "The Seven Badniks, Part 4"
Q&A Zone: David Gibbon answers reader questions regarding Rocket Knight Adventures and Puggsy. Graphic Zone: This issue's theme is "Animals", with the usual STC characters disguised as Earth animals. Owners of the printed art won a pack of Crayola Overwriters. Speedlines: Megadroid answers questions regarding a girlfriend for Knuckles, the phasing-out of the Master System and the lack of visits of the Sega Bus to Scotland. Letters and pictures won readers a Highgrove Stationery Set.